Layering necklaces is easier than you think! We can’t get enough of this season’s layering trend! Here’s how to create a show-stopping display with this look. 1. Start with a statement piece. This can be a gorgeous pendant, a locket, or even a chunky bead necklace. It should be slightly shorter than your other layers and be different enough from the others that it catches the eye. This is the focal point around which you will build the other necklaces. 2. Add the remaining necklaces. These should be a mix of thin beaded necklaces or various chain necklaces. At least two of them should be the same length to give the look some width, and there should be at least two or three different lengths of necklaces for a complete layered look. 3. Tada! 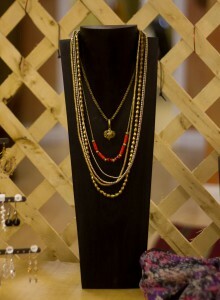 You have a beautiful layered necklace display. This type of necklace looks best on a tall display, such as our wood hand-carved necklace displays (shown above), or one of the 14” necklace busts.